I've spent the last couple of days preparing for the BBC MindGames review, in case it generates any sales, and trying to take advantage of the time off to get some prototyping done. On the prototyping front I've made a new version of the submission (currently called Codename: Monster), and finally finished the prototype of Codename: Sennon too. I've been to town on my website (although I've not yet published the new version - should be in the next day or so), adding the postage and packaging prices, and PayPal 'Buy Now' buttons. I've also added the Border Reiver rules, so that people can review the rules before deciding whether or not to purchase the game. I've also been cutting out tiles for England. It's a horrible job that's really hard on my hands, so I try to spread it out. I've been doing one copy a day for a while now, and I'm going to try to go up to two copies a day until I've finished the ones I've got down in Bristol (I brought nine sets of tiles, and as of this morning I've done four). I've no idea whether or not the MindGames review will generate any sales, I'm hoping so but I just don't know. I love Christmas. It's the only time during the year that both my family and the in-laws all get together (though separately!). Plus presents :-) I'm also lucky that both my family and the in-laws are keen to play games over Christmas, yeay! Christmas Day started well, with a copy of PitchCar from The Wife :-) I'd only played it once before, but I loved it, and I thought it would be good to have a dexterity game, as it's a genre that was un-represented in my games collection. I also managed to fob-off my copy of Munchkin Fu onto Matt, who loves it - I need to make room in my tiny flat for a new game. Since I've arrived at the in-laws I've finished a new prototype version of the submission (currently known as Codename: Monster), which features a different theme, and more pieces allowing the game to be played with up to six players. I tried it out a couple of times on my own once two player and once three, but it's difficult to play a game that features hidden information when you're playing all the players! I've also done a little work on Codename: Sennon. Christmas Day was spent at the in-laws, and we broke out PitchCar and had a few games of that, and then played Trivial Pursuit in the evening. It was a newer version of Trivial Pursuit which played a bit faster - still it's not a game I enjoy. Boxing Day we went round to my family's house for more food and present-opening. I took PitchCar as I though it would go over well and it did - we played seven games during the day and evening. We also played three games of Codename: Monster which was very well received, despite only having very basic components with bits scribbled on in pencil and loose change for tokens. Last night I received my advance copy of BBC MindGames magazine featuring the review of Border Reivers. The review is on the This Month page, and if you're familiar with the format it's the large review at the top of the page. It features a really nice photo of the game and box, the company URL, the price, a text review, a summary and a star rating (out of five). The review is generally pretty positive but is critical of the readibility of the rules - this was to be expected as I had to go down to teach the reviewer how to play the game. ...doesn't mean I've stopped making games. I have slowed down however. I've been very busy socially the last week or so - lots of parties and meals out. I've been trying to balance that with the goals I've set myself for game construction. My current status is three finished copies, with four outstanding orders, three of which I'll fulfill over Christmas (they are the friends and family orders I got at my sister's wedding - the shame!). I've also got nine copies that are complete except for the tiles. I've got three sets of tiles glued and ready to cut out, and this evening I'm going round to a friend's garage to do the gluing for the other six. That'll mean I've got nine sets of tiles to cut out while I'm down at the in-laws for a couple of weeks. Each one takes just over and hour, and I try to limit myself to one set a day as it is hard work and knackers my hands. I'm doing a big push because the reivew in BBC MindGames Magazine comes out on 2nd January while I'm down in Bristol - so I need to take some copies with me in case it generates some sales. I've also been thinking about the submission (including spending yesterday lunchtime looking into illustrators for a potential release), and Codename: Sennon, writing some software to generate hexes, so that I can print out guides to cut out the hex tiles. I wanted to get a first Sennon prototype finished this month, and now I can with very little effort while I'm down in Bristol. I'll probably post a few times over Christmas to let you know how construction and playtesting are going, but until then: Merry Christmas! All that remains is to wish you a Merry Christmas and a Happy New Year. I’m looking forward to posting in the new year with some exciting new ideas! Dave came round Tuesday night, ostensibly for more Space Hulk, but we both really wanted to do some playtesting too. Dave had brought Citywise, and I had Artist, Jorvik and 'The Submission' to get to the table too. First up was 'The Submission', which I'll be pretty vague about until I've made a decision about it. The game is designed for 2 - 4 players, and Dave and I played a 2-player game. Initial impressions were that the game would definitely be better with more players, it was good fun with just two though. Dave ended both rounds, and although I won on points in the first round by a small margin Dave slaughtered me in the second, striding to a comfortable victory. I need to play this a lot to reach a firm decision about whether or not to invest large amounts of my money and free time in publishing it. Initial impressions were favourable though. I'm not wholly convinced about the theme, I like the theme, but as a publisher I've got to think of the theme as the hook that will take a potential player from seeing the box to wanting to buy (and play it). I don't think the theme as it stands is the best for that given the market I'll be predominantly selling to (the UK). After that we had a quick game of Jorvik. Dave didn't seem overly enamoured of Jorvik, noting that there was very little player interaction. This is something that I'm aware of, and need to put some effort into fixing. Hmmmm. Dave won again, Two for two. The third game of the night was Space Hulk. We've been playing this now over a few weeks, taking it in turns to play both sides of each mission. It was my turn to play the marines in the third mission, and with a nice winning streak behind him already for the night, and knowledge of how hard this mission is for the marines, Dave thought he stood a good chance of winning his first Space Hulk game. And he was right. So right. I was slaughtered, in about four turns. Oh, how the mighty have fallen - nice work, Dave! Seeing as Dave had made such short work of me in Space Hulk, we decided to get a quick game of Artist in to round the night off. I explained the rules of the game to Dave and we were off. As I've mentioned before, Artist can be a bit of a brain-burner, and leaving it to the end of the night was possibly a mistake. Still, I enjoyed it (and I think Dave did too), and I finally won something. I'm beginning to think that Artist is possibly closer to publishing than Jorvik, despite being much newer - I need to play it a lot more to make sure. Dave had some good ideas too about how to simplify the scoring areas. Another good night of games. Last night I went round to Paul's again for his weekly games night. He'd asked me to bring Puerto Rico this week, which I did, but I got there quite late, so I wasn't sure if we'd have time. When I finally arrived I realised the others had waited for me! Bless them. With Vin still to come, we set up a quick game of Guillotine for the four of us: Andy, Greg, Paul and I. Andy got off to a great start (I think his first turn put him on three times as many points as the rest of us, thanks to a Double Feature card), and the rest of us spent the game trying to scupper him. Andy was delighted (he doesn't usually win), and even though I wasn't winning (or even coming close until fairly near the end), I really enjoyed this one again. It's funny, it's fast and it seats loads - great stuff. Final scores: Andy 24, me 19, Greg 18 and Paul 14. 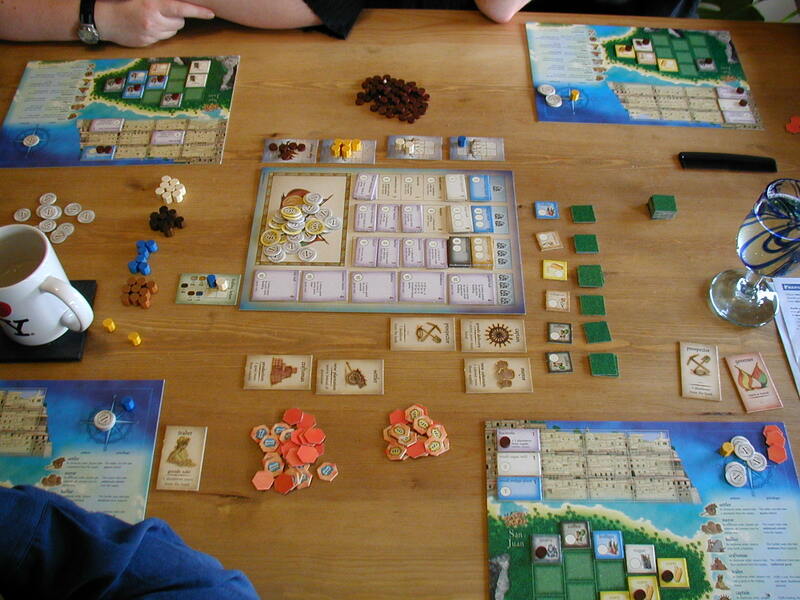 During Guillotine, Vin arrived, so as soon as that was over we set up Puerto Rico, for a 5-player with all of us. I love Puerto Rico, but I'm not very good at it. I recently looked at an online strategy guide for the first time, and with that in mind I tried a different strategy during this game, eschewing quarries, and instead trying to get loads of money together with an idea of building factories/wharves/big buildings. I met some of those goals (Factory), but Greg had managed to fill up his island far quicker than I was expecting, so I built the Residence big building in the final turn - but didn't even get a chance to get it occupied, hence missing out on most of the points. Greg's speedy finish caught a few of us out - so he won handsomely: Greg 35, Paul, 30, me 30, Vin 25, Andy 23. Puerto Rico went surprisingly fast with a bunch of players who all knew what they were doing, so we had time at the end for another quick filler. We chose Diamant. Lisa joined us for this one, and while we were playing I was bearing in mind Hugo's criticisms of Diamant. 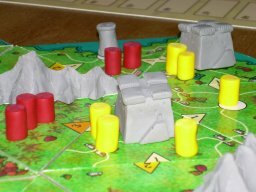 If you play the game purely as a press-your-luck game, only considering the likelihood of a second disaster coming out then I think the game would be a bit dull, but the bit I enjoy is trying to second-guess my opponents, and take the lion's share of the remaining gems on the way out. Is this a winning strategy? Nope. I don't think I've ever won, but every time I escape on my own and claim a few gems from the cards I get a little hit of 'I win', from choosing the right time to leave so that I don't have to share - and I still enjoy it. Paul didn't have any gems after the first four mines, but he still managed to beat me, so that'll give you an idea of just how bad a strategy it is :-) Final scores: Vin 28, Lisa 14, Paul 11, me 9, Greg 8, Andy 5. Yet another great evening of games and top company, very entertaining. Highlights would have to be Greg's expletive outbursts and his apoplexy when I quoted from the Planetary graphic novel at him :-) Sadly, that's my last one before Christmas, so I've got four weeks of cold turkey. 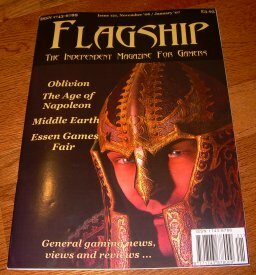 I got home from work tonight to find a big envelope waiting for me - it's Issue 121 of Flagship Magazine featuring an interview with yours truly on page 12. Cool. It's quite exciting, and hopefully it'll generate some sales... Thanks to Mike Dean for the interview questions, and Flagship for publishing it. Hi there, time for my weekly update. Again, it’s been a busy week so I haven’t had many chances to get gaming. Playtesting has continued on Citywise to ensure that the new Riot and Patrol mechanisms are working okay. As a special treat, here’s a shot of Citywise set up for playtesting. It’s halfway through the game, so two Riots and Patrols are on the board. What’s next? Well, more playtesting; but I’d like to start writing the ‘blurb’ on some of the cards to really add to the whole feel of the game. Fortunately, this is one of the best aspects of game design, coming up with the background and theme (often called ‘Chrome’). So I’ll be watching lots of Sci-Fi on TV, reading lots of comics and doing as much daydreaming as possible! All the best, see you soon! I spent a decent chunk of the weekend making copies of Border Reivers. We had to cancel a few events as The Wife was ill, and although I felt like I was coming down with it too, I managed to fight it off (so far...). So we stayed in, and I made loads of games. I did another couple of sets of tiles, finishing of two more copies from the batch of six I started a week or so ago, and started another batch of six - making the boxes and labelling the box trays (lids to follow). My stock status is looking a little healthier (three finished copies, and ten copies in progress), with four outstanding orders. Once I've finished the first batch of six I will also have made fifty copies - half the run. This will feel good - though it's taken me over four months to do it. I'm almost on the home straight. I also bought some card on the weekend so that I can make another Jorvik prototype and finish the Sennon prototype I started down in Bristol last month. I've had some ideas to try to boost the player interaction in Jorvik, and tie some of the mechanics more tightly to the theme. However, they might just over complicate things - I'll have to try it out to see whether it works or not. I can't see me getting much construction done this week - we've a lot of social events on, but I will get to Paul's games night again, and hopefully Dave will pop round for more Space Hulk plus some more playtesting of his Citywise prototype and maybe even some of my prototypes. This blog gets a surprising number of hits everyday, and that's not including people who read the feed, but don't visit the front page. I know who a few of our readers are, but there are lots I'm unaware of. So I've had an idea. Please write in the comments who you are, where you're from, where you heard about the blog, and what you'd like to see more or and less of here. Thanks! In other news I'm coming down with the cold that plagued The Wife last week I think. But I've managed to make a set of tiles, and finish the cards for the next Border Reivers batch. Almost ready to start another batch. The last few days have been very busy - hence the lack of posts. Unfortunately I had to cancel games with Dave on Wednesday (sorry, Dave! ), but I spent the evening constructing the next batch of Border Reivers. I'm behind again (I've three finished copies at home and six outstanding orders), but I'm doing well on the next batch of six copies. Wednesday night I finished labelling the boxes, and the Thursday morning, before I left for a job interview in London I did some more construction. I've just got the cards and tiles to do now - and I got the tile gluing done on Tuesday night in Rich's garage again. I'm trying to get some stock together before Christmas, as I'll be unable to make any copies for two weeks over Christmas, and the BBC MindGames review comes out during that period. Monday night I went round to Paul's again for games. Paul had asked me to bring Settlers of Catan plus the 5-6 player expansion, and Ticket To Ride to get Lisa to join in with us. First up was Ticket To Ride by Alan R. Moon. Andy, Greg, Lisa, Paul and I set up a 5-player game, and just as we got started Spence arrived. Since Lisa hadn't played before Spence played with her. The game was a good one, Lisa was winning through most of the game, and also got her hands on the longest route in fairly short order. Spence suggested a few long routes too, which helped. I got a couple of fairly short tickets early on and then tried to keep up on points by claiming some long routes - but I was beaten to a few of them. In the end Lisa didn't complete all her routes, but she still won by a mile: Lisa 102, Andy 84, me 84, Paul 80 and Greg 69. 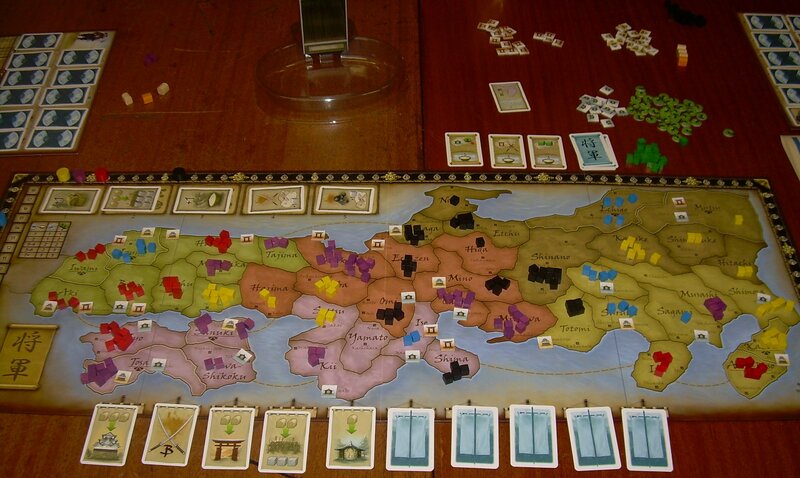 I was also amazed at the number of rules that I had wrong in the numerous games I'd previously played - loads of them! The second game of the night was Settlers of Catan and the 5/6 player expansion. I'd not played this in absolutely ages, and I thought that the 5/6 player slowed things down too much. I was right. Despite a very entertaining game in terms of Settlers humour ('I've got wood for sheep', 'I've wood and two stones'), the game did seem to drag. With everyone being given the chance build after everyone's turn the game lasts a lot longer. Spence seemed to be the man to beat throughout the game as he collected a staggering amount of sheep and wood, and built lots of cities - but at the last moment Paul stole the longest road and beat us all to 10 points. Paul 10, Spence 8, Greg 7, me 7, Andy 6 and Lisa 4. It was another great evening of games - thanks Paul! In other news I did the gluing for the tiles of the next batch of Border Reivers last night, and I made a bunch of rulebooks too. The next thing to do is to start labelling the boxes which I plan to start tomorrow morning - I've got the day off work for a second interview for the promotion at work which is down in London, and I don't need to leave home until lunchtime. Hello all, its Dave here again with the latest update on my games. Last week, I just gave a general introduction to myself and the games that I’m working on. This week I’ll focus on the work that I’ve been doing on Citywise, my game based around a city in a dystopian future. The first major changes have been to the board, instead of lots of small spaces for the players to move around in, there are now 25 larger squares representing entire city blocks or sections of streets. Of course, I have had to reduce the movement rate for characters as well, but that’s no big problem. There are a lot of advantages in increasing square size; it means interaction between characters is more likely and so is an encounter with a riot or police patrol. After a playtest with Jack we came upon the idea of a ‘moving’ element of the game, such as riots spreading throughout blocks or patrols roaming the streets. I tried out some ideas and settled upon these being moved by players during the action phase after a re-ordering of the turn sequence. I have also had to extend actions throughout the whole game to ensure that patrols and riots didn’t get stuck in one location for the final third of the game. I have increased all the characters statistics from a maximum 10 to a maximum 12 and made them all movable. This ties in with the rationalisation of item cards as I can now reduce the types of dice in use to D6, D12 and D20. The problem that I have had when developing this game is to ensure that there are plenty of options for the players, without presenting too many decisions that would slow down the game. As an example, one worry that I had was that people would go to a shop to buy items only to spend ten minutes searching through the item deck to see what was there. I considered providing a list of all items so that people could window shop, but that would cause just as many problems. The best thing to do was to rationalise the items in the shops, so instead of having 6 different types of weapon, there are only 3 types available, the same for Tech items as well. Though to ensure that the ‘chrome’ of the game remains intact, I will be ensuring that each class of weapons has a range of different pictures and descriptions. I had another solo playtest last night, and all the elements seemed to gel together in a good way. The next step will be to rope in my playtesting buddy Jack (you may have heard of him) to give it a try. See you all next week. Yesterday I spent the day at Beyond Monopoly for the first time in a couple of months. I'd missed the last few due to family commitments, holidays and production. It felt good to be back. As I arrived, Andy, Alan and Rob were going to play Saboteur by Frederic Moyersoen, and they offered me a seat. By the time we'd got the game set up Adrian, Mike and Paul D had joined in too. We played a single round, then Adrian, Mike and Paul left to play Oltre Mare. Fortunately we were able to pick up Wolfgang, Kevin and Keith who filled the seats. We eight played another two rounds. I'm still not convinced about Saboteur, I like the idea of two teams both playing co-operatively against each other, I like the idea of hidden roles so that you don't know who is one your side. But somehow it just doesn't seem to come together. I spent large periods of the rounds with no useful cards to play, and even when I did I couldn't play a card which would keep my role secret. It was alright, but I'm not enamoured of it. Final scores: Rob 8, Andy 7, Alan 6, Adrian 3, Mike 3, Me 3, Wolfgang 2, Kevin 0, Keith 0. My second game of the day was Modern Art an auction game by Reiner Knizia. Rob, Alan and I were nearly joined by Hugo of Bode Gueims, but he sat out in the end to let Jeff and his Wife (whose name I've forgotten) play with us. I'd not played Modern Art before, and I enjoyed it - it covers an awful lot of different types of auction as you bid for works by different artists, trying to gauge which artist will be the most popular. It's very interesting, as you get to choose which paintings to offer for sale, and then bid for them - bearing in mind that the money you spend goes to the person who is offering the painting. I didn't think much of the artwork, the Pop Art ones were ok, the rest were crap though. It's hard to gauge how much to pay, Rob, Alan and I were fairly conservative in our spending while Jeff and his Wife spent money like water. In the end it paid off for them: Jeff 462, Jeff's Wife 444, Me 391, Rob 358, Alan 242. Over our lunch break I introduced Alan to Hive and we played a couple of games. I really like Hive, it appears so simple on the face of it, but with so many choices to make it's surprisingly deep. I managed to beat Alan twice, but I'd imagine now he's got a couple of games under his belt he'll beat me fairly soon. After lunch Alan (who was fast turning into my games chum of the day) wanted something a bit meatier. It was time to break out one of Jon's freebies. Jon had tried to prise some free games out of publishers at Essen for the club - it worked - he came back with sixty-odd. 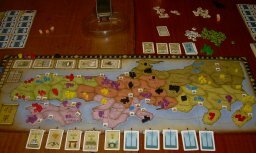 We chose Shogun by Dirk Henn, a re-themed version of Wallenstein. We were joined by Hugo, Paul and Andrew for a 5-player. After punching it out we started going through the rules, since none of us had played it before. The rules seemed a little intimating, and there were lots of components but the pieces looked beautiful and I'd heard good things about Wallenstein (it's ranked very highly on BoardGameGeek. After the first turn it was pretty straightforward, and I really enjoyed it - the theme helped, I'm a big fan of feudal Japan as a setting for games, books and films. There was a nice balance of combat and resource management. I'm not convinced about the battle-tower as a method for resolving combat, but it's a nice component so I'll give it the benefit of the doubt for now. At the end of the first year I was winning, having a lot of territories, and a good mix of buildings, however in the second round I lost a few territories and was pipped at the post by Paul. Final scores: Paul 47, Me 45, Hugo 43, Alan 40 and Andrew 24. The final game of the day was a nice quick game of Diamant by Alan R. Moon and Bruno Faidutti. Paul had to leave, so it was just Alan, Andrew, Hugo and I.
I'd played this before at Paul's games night so I knew what to expect. It's a fast and fun press-your-luck filler. We played the five mines, with Hugo building up a fairly unassailable lead early on. The middle mines were really unlucky drawing lots of disasters right at the beginning. After a few cards I was the only person left in the last mine, again we'd had a lot of disasters so the others pulled out. I chose to stay in and try to beat Hugo's score, but I quickly hit another disaster and lost everything. Final scores: Hugo 68, Andrew 36, Alan 24, Me 21. It was a really good day - I thoroughly enjoyed it. In the evening I did some construction, finishing the boxes for the next batch. Here's my second monthly report - letting you know how my gaming and games designing has gone during the last month. I'm hoping that it will provide me with an opportunity to keep track of whether or not I'm getting what I want done. First up, games played. I played far fewer games in November than October, I missed both Beyond Monopoly days, and only made it to two out of four of Paul's games nights. Dave came round for Space Hulk again though and I played some games down in Bristol with my family and my in-laws. Total games played in November: 19 (excluding prototypes). Hey! That's My Fish! : 3 plays. Mission: Red Planet: 2 plays. Ticket To Ride: 1 play. Twilight Imperium 3rd Edition: 1 play. 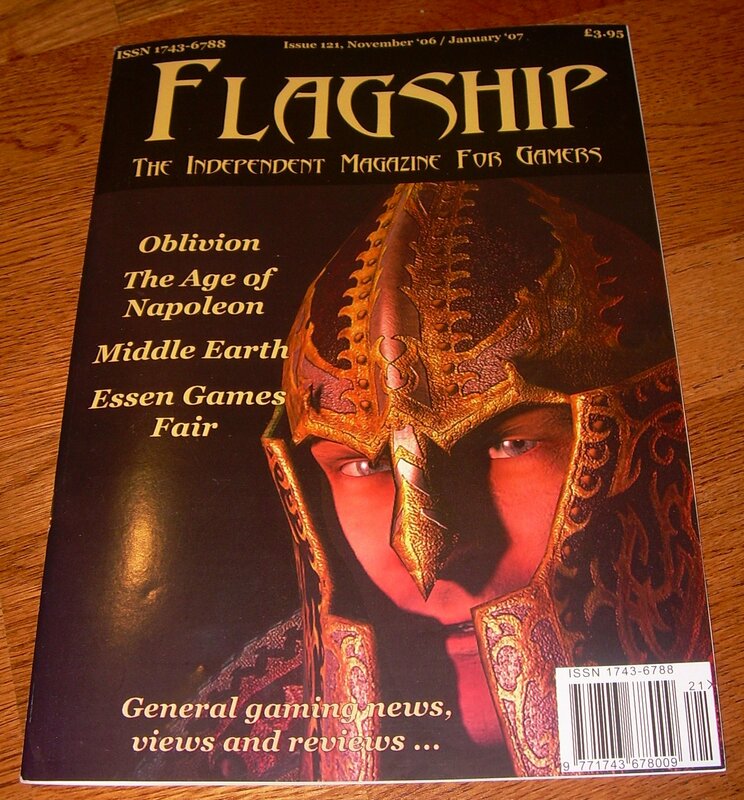 Only two new games this month: Flanderen 1302 and Mission: Red Planet. Of the two I prefered Mission: Red Planet - I loved the steam punk theme and the game was good fun too. I bought one new game this month again (Carcassonne: Inns & Cathedrals), which I've not yet had a chance to play. I've played it before though, and it's a good one I'm sure it will get plenty of play in the future. Looking forward to December I'm still really hoping to get a game of Canal Mania in. I had it down as one of the two games I wanted to play in November, but seeing as I didn't get to BM there was no opportunity. With any luck I'll get a chance to play it at BM this afternoon. I'm also looking forward to hanging out with my family and my in-laws at Christmas - we'll probably play some games, possibly including Shogun. Border Reivers had a mixed month. I sold another nine copies, mainly towards the end of the month after a slow start. I've gained a few more ratings, but the average has dipped below seven again. In terms of publicity I've had confirmation that the interview for Flagship magazine is going to be printed, and they're going to review it too. Also the BBC MindGames magazine have a review coming out just after Christmas. Codename: Jorvik has seen a fair amount of play (not included above). I made a new prototype of Jorvik which simplifies a bunch of things and make some things slightly more involved. I'm pretty happy with this new version, but I've several more ideas to try out, I'll have to give those a whirl over December. 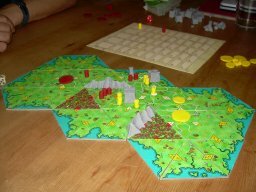 One of my goals for November was to make a Sennon prototype, but sadly I only got it half made - I've some of the cards made, but no tiles or counters - I want to get a prototype done to take down to Bristol at Christmas so I can play it with friends and family and start the design process in earnest. This one came out of the blue while visiting my family mid-month. Dad suggested a single word, and within twenty-four hours I had some rules scribbled down in my notebook. I made a prototype and then got to play it a couple of times the following weekend. I think it's got potential, the original scoring idea was completely broken, but that's been swapped out and hopefully I can make some progress on this one soon too. In other news I did another set of tiles last night - finishing another copy. I've now got three finished copies at home - yeay! But I've seven outstanding orders! I also started making boxes for the next batch, a batch of six. I cut them all out and assembled three box lids. I'm off to Beyond Monopoly now - session report up tomorrow. Wednesday night was good. I got another gamer sale. I had some good news about my publicity. But last night was legendary. Seriously. When I come to write my autobiography it will deserve a whole chapter. They'll be singing sagas that tell the tale of this night for centuries to come. Ok, perhaps I'm over-selling it, but I feel really good again. As I'm sure you noticed I was feeling a bit down, sales were thin on the ground and I was feeling a little disappointed, wondering whether I'd made the right decision investing so much of my time and money into self-publishing Border Reivers. Last night reassured me. I'd been spending more time with The Wife and with friends and family, and I'll be honest, production had slacked off a bit. It's been nice to see so much of my family over the last few weekends, I usually only see them a couple of times a year, so it's been really good to see them more often. I've also really enjoyed spending more time with The Wife. Border Reivers production takes up a lot of time, and I'd been spending almost all my free time on it for several months. I'd intended to spend last night on construction (the first for over a week), with the bunch of orders at the wedding, plus another order earlier in the week I'd fallen behind. I needed to get some copies finished off. Before I started I checked my email (as I do habitually most evenings and mornings), and trawled through the usual thirty-odd spam messages offering stock tips or various bedroom medications (you know the ones I mean ;-) ). This time there were a bunch of real emails for me! Another designer had let me know he had sent me a prototype to playtest for possible publishing, the reviewer from BBC MindGames confirmed the review is in the February edition (out 2nd January) and is going to send my parents a free copy of the magazine too - since they lent her their copy to review. Nice touch - I'm impressed. It got better. I had an order from a customer after two copies! Yeay! I also got some construction done, too. Good stuff.